The Detroit Auto Show opened up with the North American Car and Truck of the Year awards, which was questionably awarded to the Chevy Malibu and the Mazda CX-9. Today the EyesOn Design awards presented four awards for design excellence and at least three of the four winners made sense. 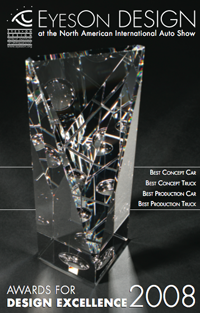 The award for the best production car went to the Cadillac CTS-V, which is very deserving. Also deserving is the BMW X6, which won the best production truck. The best concept car went to the Cadillac CTS Coupe. The oddity was the best concept truck, which went to the Chrysler ecoVoyager. Calling the ecoVoyager a truck is like calling a dragon a virgin.